Boechera sparsiflora,(formerly Arabis sparsiflora) is a perennial herb that is native to California and is also found outside of California, but is confined to western North America. 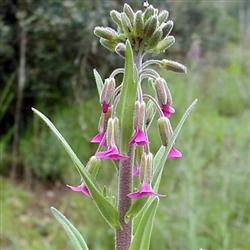 The leaves vary in shape from linear to arrowhead-like and may or may not have toothed edges.This plant sends up a tall flower stem with a mass of dangling flower with spoon-shaped petals in shades of purple or pink. It is rarely found in nurseries but we encourage planting as this is and important larval host for the Orangetip butterfly.